In an original oak leaf and acorn running-pattern frame, as favoured by the artist for his Royal Academy pictures. with Thos Agnew & Sons Ltd, London. Anonymous sale; Phillips, London, 22 July 1980, lot 47.
with the Fine Art Society, London, September 1980. George Thomson, 'Henry Herbert La Thangue and his Work', The Studio, vol. ix, no. 45, December 1896, p. 176. Academy Notes, 1897, pp. 16, 93, illustrated. Academy, 8 May 1897, p. 503. The Art Jounal, 1897, p. 174, illustrated p. 175. The Athenaeum, 15 May 1897, p. 655. Graphic, 8 May 1897, p. 570. Illustrated London News, 8 May 1897, p. 645. The Magazine of Art, 1897, pp. 155-6. Pall Mall Gazette 'Extra', Pictures of 1897, 1897, p. 21, illustrated. Royal Academy Pictures, 1897, p. 39, illustrated. The Speaker, 8 May 1897, p. 518. The Studio, Extra Number, 'Art at the Royal Academy', 1897, p. 11, illustrated. The Times, 1 May 1897, p. 16. J Stanley Little, 'Henry Herbert La Thangue ARA', The Magazine of Art, 1904, pp. 3, 6. Kenneth McConkey, A Painter's Harvest, HH La Thangue, 1859-1929, 1978 (exhibition catalogue, Oldham Art Gallery), p. 36. London, Royal Academy, 1897, no. 439. Oldham, Oldham Art Gallery, Henry Herbert La Thangue, A Painter's Harvest, 1978. A boatman rows back to the distant jetty, having left three itinerant field workers to trudge up the shore with their belongings. The girl carrying a bundle and wearing a tattered apron leads a harvester with a scythe and cast iron cooking pot, while a woman pushing a barrow loaded with their belongings completes the trio of Travelling Harvesters. Presently they will arrive at the edge of tomorrow's field and pitch camp. The pot, suspended over an open fire, will provide a simple meal and the weary child will fall asleep against a corn stook (fig. 1). In the days when rural naturalism was the subject of much theoretical discussion, this plein air painting, with its broad, flat, square-shaped brushstrokes, is almost an academic exercise in deploying new, controversial methods. La Thangue was to be dubbed the leader of the 'square brush school'.7 Nevertheless the interest in bringing figures forward in space to create a sense of real life encounter, continued in works such as Nightfall in the Dauphiné, 1892 (unlocated) and The Woodman, 1894, (Private Collection) before being reprised in the most significant work of the sequence, The Travelling Harvesters. If story-telling was absent from the work, symbolism was not, and it would be naïve to assume that La Thangue was not fully aware of the connotations of men with scythes. He might well have picked up on the poor press coverage of John Everett Millais' unsubtle Death the Reaper, 1895, (fig. 3) a picture of a black-draped angel with a scythe, shown at the New Gallery. This is the effect La Thangue hoped to convey in the fading light of a late summer evening. Circumstantial details - the ragged apron, the cart, the boatman and the distant cottages dilute the effect of death the reaper and bring George Heming Mason's plaintive Harvest Moon, 1872 (fig. 4) to a new generation - a generation tampered by Lhermitte and Jules Bastien-Lepage. As a student in Paris, he would have seen Lhermitte's heroic La Paie de Moissonneurs (Paying the Harvesters), 1882, La Moisson, 1883 and La Fenaison, 1887 - works which swept away the flimsy British swains of the Idyllic' School of Mason and Fred Walker.10 Close study of La Moisson was made more possible after it was acquired by Isaac Smith, one of La Thangue's leading Bradford patrons.11 It was necessary a dozen years later to draw together French prose with British poetry. Within a year of Travelling Harvesters, La Thangue was elected Associate of the Royal Academy. Its well-observed evening light was resumed in Nightfall, 1898 (fig. 5) and The Harvesters' Supper, and the theme was further explored in the extraordinary Love in the Harvest Field, (fig. 6) of 1899. Around these works, Gleaners, 1897, A Sussex Cider Press, (1898), Cutting Bracken, 1899, The Ploughboy, 1900 and Dawn, 1901, flesh out the most important series of 'historic' records of English field labour, celebrated in the novels of Thomas Hardy and Richard Jeffries. Reflecting on this sequence in 1904, when the painter's attentions had turned to Provence and Liguria, James Standley Little recalled that 'one of his pictures, Travelling Harvesters represents a phase of agricultural life likely to become extinct'.15 In a country that had witnessed industrialisation and the rapid growth of new centres of population in the midlands and the north, La Thangue's harvesters were indeed, a dying breed. But there was no time for effete Virgilian elegies. Weary they may be, but the rude health of these survivors will starkly contrast with the weakling city conscripts recruited to fight the Boers and lead to debates about public health and 'the condition of England'.16 For Little, writing in the wake of the South African War, this single, monumental image lived on in the memory. 1 George Thomson, 'H H La Thangue and his Work', The Studio, vol. 9, no. 45, 1896, p. 176. 2 Charles Knightly, Country Voices, The Life and Lore of Farm and Village, 1984 (Thames and Hudson), pp. 123-5. 'Stooks' in earlier times, consisted of ten sheaves, one of which would be taken by the village parson as a tithe. 3 H Rider Haggard, A Farmer's Year, 1899 (Cresset Library ed., 1987), pp. 285, 294-5 explains the farmer's doubts. This text was based upon articles which appeared in Longman's magazine in 1898 and is concurrent with The Travelling Harvesters. Flora Thomson, Lark Rise to Candleford, 1968 ed., (World's End Classics), p. 44, indicates that mechanical reapers were considered as farmer's playthings at the period. Nevertheless a labourer with a scythe could mow an acre in a day, while a mechanical reaper, if it did not break down or fall into ruts, might do seven or eight acres. Scythes at the time of cereal harvest were fitted with 'creets', as shown in The Travelling Harvesters. 'Creets' were bows of metal or frameworks of willow wood which enabled the cut corn to stand against the uncut row so that it could be collected and tied into sheaves more easily. 4 Alun Howkins, 'In the Sweat of thy Face: The Labourer and Work', in GE Mingay ed., The Victorian Countryside, vol. 2, 1981, p. 512. 6 This work was painted for his Bradford patron, Herbert Mitchell; see Kenneth McConkey, A Painter's Harvest, HH La Thangue, 1859-1929, 1978, (exhibition catalogue, Oldham Art Gallery), p. 21. 7 Morely Roberts, 'A Colony of Artists', The Scottish Arts Review, August 1889, p. 73. 8 Millet's Death and Woodcutter, (Ny Carlsberg Glyptotek) was shown at the Salon of 1859; Legros' Death and Woodcutter, (National Gallery of Canada, Ottawa) was painted in 1878 after the first of a sequence of prints on the theme; and Lhermitte's Death and Woodcutter, (Musée Jean de la Fontaine, Chateau Thierry) was exhibited at the Salon of 1893. For a fuller account of this peasant symbolism see Kenneth McConkey, 'Dejection's Portrait: Naturalist Images of Woodcutters in Late Nineteenth Century Art', Arts Magazine, April 1986, pp. 81-7. 9 Alfred Sensier, J-F Millet, Peasant and Painter, 1881 (trans Helena de Kay, MacMillan), p. 93. 10 La Paie des Moissonneurs (Paying the Harvesters), 1882 (Musée d'Orsay, Paris), La Moisson, 1883 (Washington University Gallery of Art, St Louis) and La Fenaison, 1887 (Van Gogh Museum, Amsterdam). 11 Smith purchased the picture from Arthur Tooth and Son in london in 1885. It remained in his collection until its sale at Christie's, 15 May, 1911, lot 86. 12 The Academy, 8 May 1897, p. 503; The Magazine of Art, 1897, p. 155-6; The Illustrated London News, 8 may 1897, p. 645. 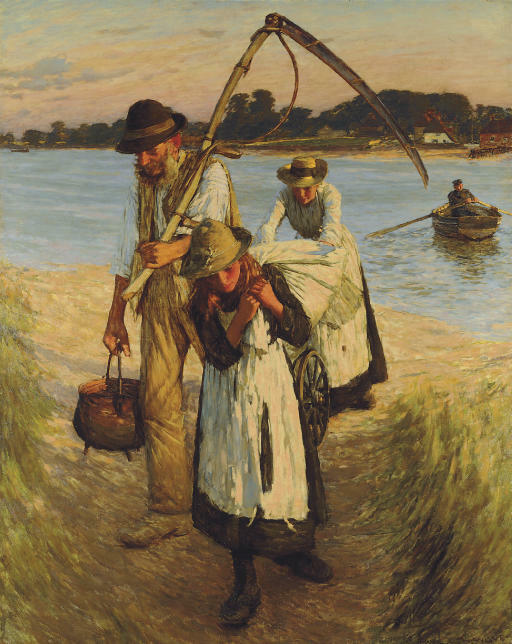 13 The Athenaeum, 15 May 1897, p. 655, cast aspersions on the documentary authenticity of the work, noting 'we demur to the notion of a travelling harvester trudging with his womankind... a scythe is much too awkward an implement to be carried about the country in this fashion'. He ought remove the blade and tie it to the handle. It also thought the picture too large. 14 The Speaker, 8 May 1897, p. 518. 15 J Stanley Little, 'Henry Herbert la Thangue ARA', The magazine of Art 1904, p. 3. By 1904 mechanical harvesting equipment had improved and although it was not yet pervasive, it was clear that the labourer's way of life was dying. See David Morgan, 'The place of harvesters in nineteenth century village life', in Raphael Samuel ed., Village Life and Labour, 1975, (Routledge and Kegan Paul), pp. 27-72.